April 10, 2019 -- Using functional MRI (fMRI), researchers have observed abnormal patterns of brain activity in patients with post-traumatic stress disorder (PTSD) that can predict a poorer response to therapy, according to two studies published online April 3 in Science Translational Medicine. The culprit is an impaired ventral attention network (VAN), which includes the insula, dorsal anterior cingulate, anterior middle frontal gyrus, and supramarginal gyrus. PTSD patients with irregular brain activity in this region had reduced verbal memory skills compared with other PTSD study participants and healthy controls, regardless of how much post-trauma treatment they received. "We found that a subgroup of patients with PTSD from two independent cohorts displayed both aberrant functional connectivity within the ventral attention network, as revealed by fMRI neuroimaging, and impaired verbal memory on a word list learning task," wrote the researchers led by Dr. Amit Etkin, PhD, from Stanford University. "This combined phenotype was not associated with differences in symptoms or comorbidities but nonetheless could be used to predict a poor response to psychotherapy, the best-validated treatment for PTSD." PTSD is diagnosed through a variety of clinical symptoms, such as poor attention or memory function, that could be due to a combination of causes. Etkin and colleagues hypothesized that PTSD's symptoms could be explained by evaluating neuroimaging data based on cognitive task performances. "Specifically, we posited that brain functional data acquired using resting-state fMRI connectivity might differ between patients with PTSD who had cognitive impairments and either healthy individuals or patients with PTSD whose cognitive performance was in the healthy range," they wrote. In their first trial, the researchers performed resting-state fMRI scans on 112 subjects, 76 of whom were diagnosed with PTSD, followed by behavioral and clinical assessments. The subjects then were asked to memorize blocks of 20 words, recall them immediately, and then again 15 minutes later in order to gauge their memory skills. From there, 36 PTSD patients were randomly chosen to receive prolonged psychotherapy, while 30 received no treatment at all. The second study included 245 Iraq/Afghanistan-era combat veterans: 128 men with PTSD and 117 trauma-exposed healthy soldiers. All participants underwent the same fMRI scans, clinical assessments, and memory tests as in the first study, along with electroencephalography (EEG) with transcranial magnetic stimulation (TMS). TMS is designed to stimulate nerve cells in the brain to improve symptoms of depression. These subjects did not receive any other therapy. 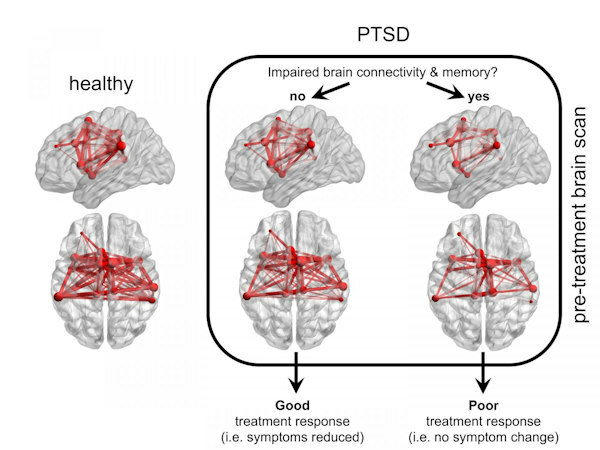 Functional MR images compare connectivity of the brain's VAN (red) in healthy individuals and patients with PTSD, and show how connectivity and memory ability are either impaired or not. Images courtesy of Adi Maron-Katz, PhD. In both studies, the researchers found a group of PTSD subjects with less verbal memory and lower VAN function than the other PTSD participants and healthy controls, despite psychotherapy. Median recall accuracies in the memory-impaired PTSD groups were 82.5% and 85% in the first and second studies, respectively, compared with 98% and 100% in the two healthy control groups and two PTSD groups with no clinical issues or VAN dysfunction. What's more, the EEG tests revealed that the brains of veterans with poor connectivity in their VAN took twice as long to recover from the TMS magnetic pulse than the brains of patients with good communication in their VAN, indicating a deficiency in information flow within this brain network. "This work constitutes the first step in a comprehensive roadmap of development that will allow us to establish clinical practice guidelines that inform a precision medicine approach to treating PTSD at the individual level," says Dr. Magali Haas, president and CEO of Cohen Veterans Bioscience, a translational research organization that contributed funding for the study. "We will continue to push towards an understanding of the role of this biomarker as a marker of response to brain stimulation and psychotherapeutics as well."